Danny Devlin (Fahey) and his buddy Ziggy Rotella (Russo) are in a small-time gang, and they decide to rob 1.2 million dollars from mob boss Gianni Grasso (Miano). However, Mo (Busey), who works for Grasso, double-crosses him by talking to Danny and Ziggy. 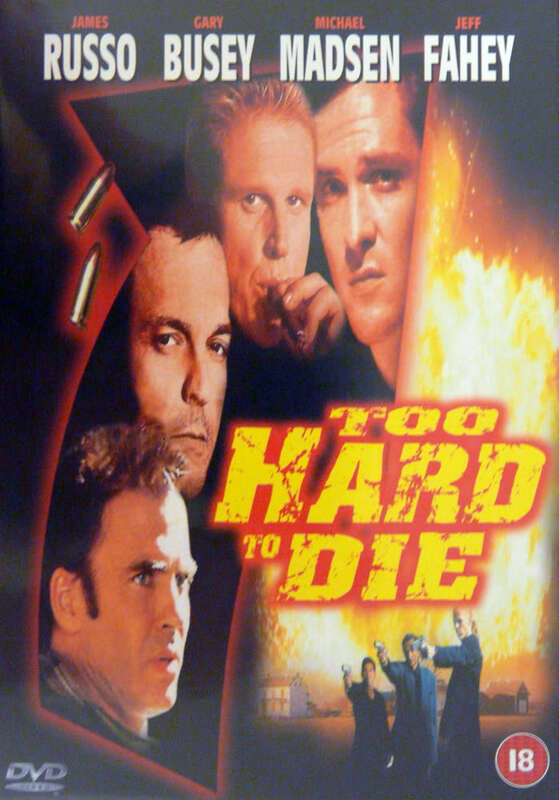 Grasso’s men go after them, and eventually Danny, Ziggy, and Gillette (Williams), the third gang member, end up in small-town Rosalia, where Danny grew up. It turns out his mother died and left him the family dairy farm, and it’s in her will that he must tend to it. While back in his old stomping grounds, he reconnects with past family members such as Mel (Thomerson), Daniella (Wood), and his brother Burl (Madsen), who is the sheriff in town. Will Danny go straight, or will the temptation of future heists and crimes be too strong? When we first saw that there was a movie that had this amazing cast, obviously we were intrigued. And the icing on the cake comes when you’re watching the opening credits, and after the extensive list of familiar names, the final credit is “Directed by Joey Travolta!” (I added the exclamation point. Sadly that’s not on his actual screen credit). You’d think, “how could this possibly go wrong?” Well, unfortunately, Detour falls prey to Lone Tiger (1999) Syndrome, which we’ve talked about before, which means that just because a movie has an impressive cast, doesn’t mean the movie itself is going to be any good. Sometimes it’s even a substitute for good writing and direction, and they hope the audience won’t notice. Joey Travolta seems to be more talented in front of the camera than behind it, as evidenced by his role in Wilding: The Children Of Violence (1991). 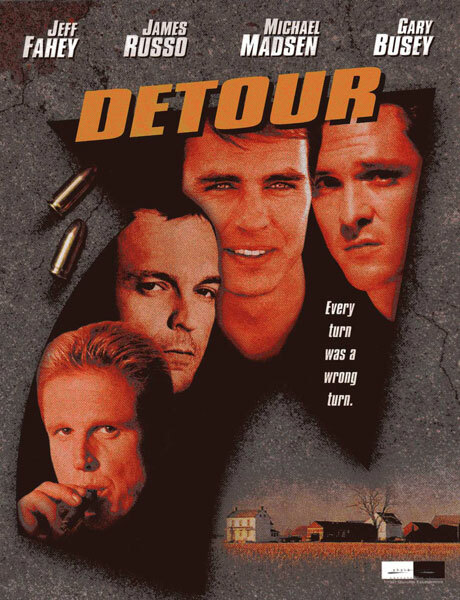 Disappointingly, Detour is just one of many 90’s Tarantino knockoffs. It tries too hard to be cool, and every other scene has some annoying “alt-rock” song of the time on the soundtrack. No one in the cast of fan favorites can save the uninspired writing. Busey and Madsen come off best, however - Busey slightly more low-key by his standards, and Madsen does what Madsen does, that is, look bored and contemptuous of even having to be there. But somehow when he does it, it totally works. Fahey goes a bit over the top at times, and even though this is supposedly an action movie of some kind, there are scenes of farm work - yes, FARM WORK - when other stuff should be going on to capture the viewers’ interest and imagination. The movie also falls prey to some other common DTV pitfalls, such as the fact that many scenes are underlit and it’s too dark to see anything. That just adds to an overall junky look and feel. But on the bright side, Gary Busey wears pajamas the whole time, and James Russo has an evil hat. Take for instance a scene in a kitchen where Fahey and Thomerson are talking. On top of the refrigerator, there is a can of a Mr. Peanut product that we think are called “Zonks”, but it’s too dark to really tell. This can of Mr. Peanut Zonks (?) steals focus from the supposed drama going on. “Does that really say ‘Zonks’?” “I don’t know, I can’t read it...I hope it says Zonks...but I’ve never heard of Zonks...” “Maybe they’re only sold in Canada.” “Who is a better mascot, Mr. Peanut or the Pringles man?” “Mr. Peanut, because he has a top hat, a monocle, cuffs, a cane, and can do things, like dance around. All the Pringles guy has is a mustache”. That’s OUR dialogue, not from the movie. In other words, Mr. Peanut out-acts some of our favorite people this time around. An amazing, once-in-a-lifetime cast is squandered because they didn’t have good material to work with. Ultimately, this is wasteful of the talented cast, so avoid this Detour into lameness. I thought this one was pretty decent, agree that it did look a bit cheap at times and it's not the best example of Madsen and Busey's talent, but it's not the worst either, the worst example would definitely be Rough Draft(AKA Diary Of A Serial Killer) a really lame and boring psychological thriller, Madsen and Busey looked miserable the entire time. We will have to avoid that one. Thanks for the warning! I recently saw this last Friday and surprisingly enjoyed it. Like venom said, it wasn't the best or worse use of Busey or Madsen but like he also mentioned, there has been far pathetic ways to do so. Have to respectfully disagree...Madsen and Busey are just wasted in their roles...Jeff Fahey is doing more farmwork than action in this one. But Bulletproof is a Busey classic!